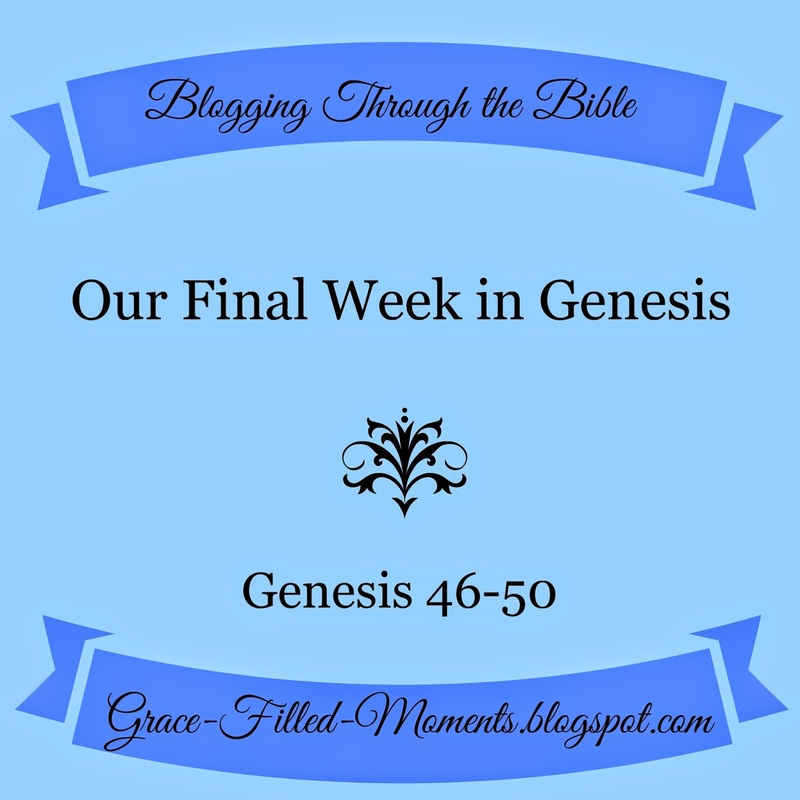 Today we begin our final week in the book of Genesis! It has been such an amazing journey through Genesis. Thanks for joining me! Here's our reading plan for this week. Observations: God tells Jacob to not be afraid to go down to Egypt. He gives Jacob four promises to comfort and reassure Jacob that he is doing the right thing by going to Egypt and has no need to fear. The first promise of God, “I will make of you a great nation there,” reveals His good purpose to Jacob for sending him and his entire family into the land of Egypt. The unconditional faithfulness of God is revealed again in this promise which reaffirms the covenant God made with Abraham and his descendants. The second promise of God, “I will go down with you to Egypt,” assures Jacob that God will be with him in this hostile enemy territory, giving him another reason not to fear. Jacob can be sure that where God is calling him, He will also go with him. The third promise of God, “I will also surely bring you up again,” reaffirms God’s promise spoken to Abraham when He first prophesied that his descendants would be strangers and oppressed in a land that was not theirs (Gen. 15:13-14), but that after 400 years God would bring them back to the land of Canaan. I’m sure Jacob had heard about this prophecy growing up. There are times in all of our lives where we need to be reminded of God’s word and to be assured that whatever God says will surely come to pass. This promise is also given as a personal comfort to Jacob that he would be buried in the cave with his fathers. The fourth promise of God, “Joseph will put his hands on your eyes,” is given to comfort Jacob that Joseph would be there with him at his time of death. Application: During fearful times of our lives, we can seek the face of God for comfort through prayer and reading His Word. We can be reminded of His promises to us while we sojourn in this hostile world that is not our true home by spending time reading the Bible. God’s Word is given to us as a lamp for our feet and a light for our path. We can’t use it as the spiritual weapon it is intended for – the sword of the Spirit – unless we open up its pages and read the words that were inspired by God. There are promises of God found in the Bible that are ours as His children. Jacob received strength for the journey ahead of him because of the promises God spoke to him. May we run to God through prayer and into His Word to receive the strength for our individual journeys of this life. Prayer: Heavenly Father, thank You for the gift of Your Word and for the opportunity to sit at Your feet in prayer. Help us to seek Your face every day for the strength we need for this journey of life in a world that is hostile to You and to Your children. We long to be with You and to live eternally in Your presence. Help us to keep our eyes on You and to not be fearful on the journey we each are taking on the road that will lead us home to Heaven. In the comforting name of Jesus I pray. Amen! Let's finish strong in the book of Genesis. I'll see you back here on Wednesday! In addition to sharing my S.O.A.P.s, I'll also be giving you information on which book of the Bible we're heading into next and about our Christmas break. **Chime in! What are your thoughts for this chapter? Please share in the comments below.